By mimicking the red and green colours of falling leaves, Bornean lizards avoid falling prey to birds whilst gliding, new research has found. The work suggests that populations of the gliding lizard, Draco cornutus, have evolved extendable gliding membranes, like wings, which closely match the colours of falling leaves to disguise themselves as they glide between trees in the rainforest. Found throughout South-East Asia, Draco is the only living genus of lizard with extendable gliding membranes - call patagia - which allow them to glide between trees in their territories. Published today in the international journal Biology Letters, the study was conducted by PhD student Ms Danielle Klomp, based at both the University of Melbourne and the University of New South Wales with supervisors Dr Terry Ord and Dr Devi Stuart-Fox and collaborator Dr Indraneil Das from the University of Malaysia. The team travelled to Borneo and observed two populations of a gliding lizard that have different coloured gliding membranes and occupy very different habitats. 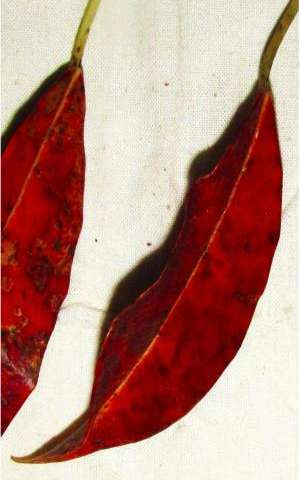 One population has red gliding membranes, which match the colour of the red falling leaves of their coastal mangrove forest habitat. 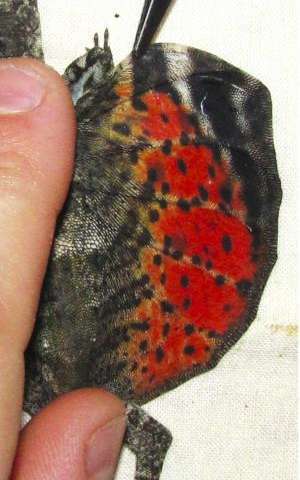 The other population has dark brown and green gliding membranes, which match the colours of falling leaves in their lowland rainforest habitat. They determined how the colours would be perceived by a predatory bird and found that the gliding membrane colour would be indistinguishable from a falling leaf in the same forest. Birds can see ultraviolet light as well as the colours that humans see, so it is important to take into account how closely the colours would actually match to a bird, Ms Klomp said. "It's a cool finding because these gliding lizards are matching the colours of falling leaves and not the leaves that are still attached to the tree. 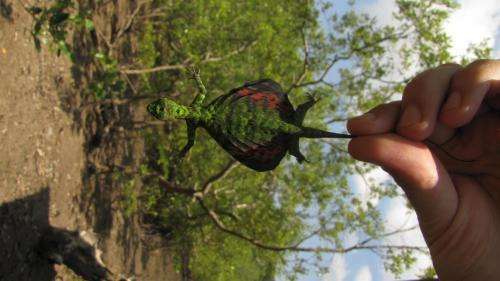 In the mangrove population the leaves on the trees are bright green, but turn red shortly before falling to the ground, and it is this red colour that the lizards mimic in their gliding membranes. This allows them to mimic a moving part of the environment- falling leaves - when they are gliding." Ms Klomp said. Because some animals have developed colour not only for camouflage, but also as a form of communication, we also wanted to watch the lizards interact in the wild and determine whether their gliding membranes were used for communication as well as gliding said Ms Klomp. The team filmed hours of gliding lizard behaviour to observe how often the colours were displayed to other lizards. "We found that both the red and green/brown gliding membranes seem to have evolved to specifically resemble the falling leaves in each population's particular habitat, and are rarely used for communication," Ms Klomp said. "Perhaps these populations may have originally had the same gliding membrane colours but as they have moved into different forest types their colours have adapted to closely resemble the colours of falling leaves in the different forests, known as divergent evolution."